Measuring the intraocular pressure (IOP) of a patient is routinely performed at every eye clinic. 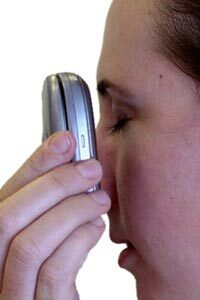 High IOP, which can be a sign of glaucoma, can lead to degeneration of the optic nerve and can cause blindness. IOP is especially a concern following cataract surgery, as the intraocular pressure of a recovering patient can spike, leading to vision loss. Though techniques such as manometry and tonometry do exist for measuring IOP, they are not able to measure continuous IOP and require assistance from a trained professional. LaunchPoint is currently developing a novel Intraocular Pressure Sensor. 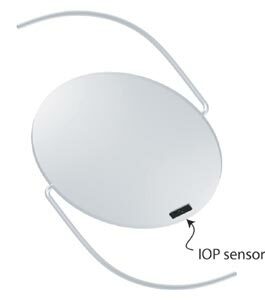 The remote pressure sensor incorporates a MEMS resonator that is either attached to an Intraocular Lens (IOL) or is injected directly into the vitreous base in the back of the eye. The apparatus is operable within a wide range of environments for remote, one-time, random, periodic, or continuous monitoring of a patient's intraocular pressure. In addition to intraocular pressure, applications for the underlying technology also include measuring blood pressure and intracranial pressure. Sensitivity -- The sensors are highly sensitive to pressure changes, and have a high-Q resonant frequency. Simplicity -- Measuring the resonance frequency is a simple task, and the small devices can be manufactured in arrays having desired acoustic response characteristics. Speed -- The sensors provide a much faster response time (tens of microseconds) than conventional acoustic detectors (tens of milliseconds) due to their extremely small size and large Q value. Variable Sensitivity -- The sensitivity can be controlled by the geometry of the microbeam(s) and the coating thereon, resulting in broadband, narrow band, low pass, or high pass sensitivity. Size -- Current state-of-the-art in micro-manufacturing technologies suggest that a mechanical structure could be mounted on a monolithic MEMS structure. Low power consumption -- The power requirements are estimated to be in sub-milliwatt range for individual sensors. Low cost -- No exotic or expensive materials or components are needed for sensor fabrication. Electronics for operation and control are of conventional design, and are relatively simple and inexpensive. The invention can be used for periodic or random operation, or used for continuous on-going monitoring of pressure changes in a wide variety of environments. Versatility -- The invention can be used for operation within a wide range of testing environments such as biomedical applications (whether in vivo or in vitro). Structural design flexibility -- The resonant structure may be formed into many different shapes and may be fabricated as a micro-circuit for use where space is limited and/or the tiny sensor must be positioned further into the interior of a sample or environment being tested/monitored. Several sensors may be positioned, each at a different location within a large test environment, to monitor pressure of the different locations, simultaneously or sequentially. Several sensor elements may be incorporated into an array to provide a package of sensing information about an environment, including pressure and temperature changes. Receiving unit design flexibility -- One unit may be built with the capacity to receive acoustic emissions (elastic nonelectromagnetic waves that can have a frequency up into the gigahertz (GHz) range) as well as frequency of the resonant structure, or separate acoustic wave and electromagnetic wave receiving units may be used.